Are you afraid of the ghost? 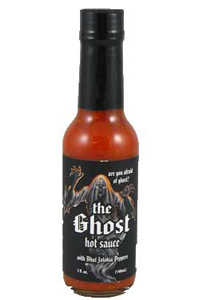 You should be afraid of this frighteningly ferocious hot sauce made with the "Ghost Pepper" from India. Formally known as the Bhut Jolokia, this fiery pepper is officially the hottest in the world. It earns its name from all those who have felt its ghoulish bite and lived to tell about it. Be careful-you could become an apparition with one incendiary taste. I haven't used the new bottle yet, it sweems the ingredient list has changed... the old one was one of my favorite hot sauce with good heat and even better flavor. Looking to use the new one very soon! Love it. Good flavor and a long lasting fiery burn. Great flavor. Warning. A little goes a long way. It's super hot. This has a good rich flavor, not just a mouthful of vinegar.